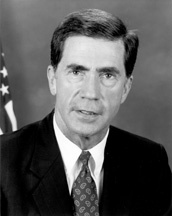 Charles Spittal "Chuck" Robb is an American politician and former officer in the United States Marine Corps. He served as the 64th Governor of Virginia from 1982 to 1986, and as a United States senator from 1989 until 2001. In 2004, he co-chaired the Iraq Intelligence Commission. Robb and Lynda Bird Johnson's wedding at the White House, December 9, 1967. Charles Spittal "Chuck" Robb (born June 26, 1939) is an American politician and former officer in the United States Marine Corps. He served as the 64th Governor of Virginia from 1982 to 1986, and as a United States senator from 1989 until 2001. In 2004, he co-chaired the Iraq Intelligence Commission. CBS 6 Video Vault - 1994 - November 09 - Chuck Robb beats Oliver North in U.S. Senate race. CBS 6 Video Vault - 1994 - October 10 - Oliver North v. Chuck Robb for Va.Senate seat. We take a look back in the WAVY Archives.